Lilah turned 2 years old this past week, so I thought it would be a good time to focus on her story. 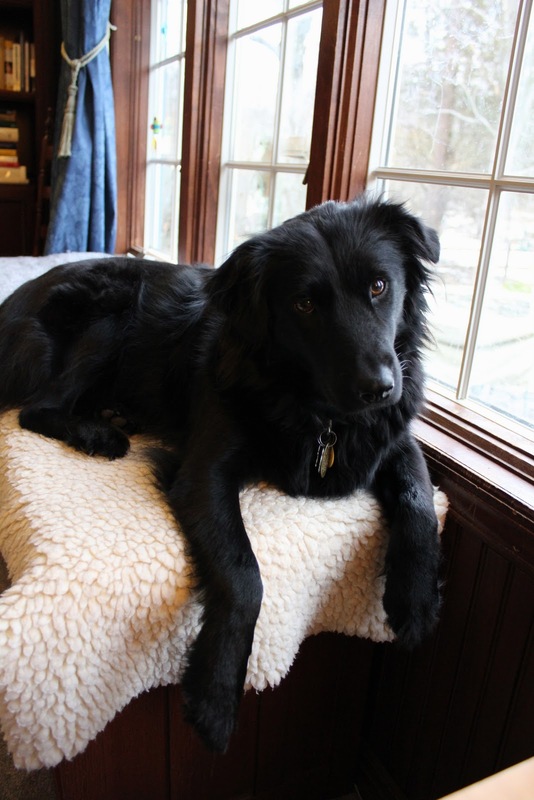 When I first saw 5-month-old Lilah, she was peeking through the rungs of the deck rail off her foster’s home, barking; she had such a big bark for a little dog. I was invited up on the porch where I met Lilah and her “brother” Jasper. They had both been pulled from a kill shelter in Louisiana and brought up to New Jersey through a rescue organization called Husky House. With gorgeous black wavy fur, Lilah looked nothing at all like her supposed littermates, including Jasper, who had short tan and grey fur. In my mind, I think the folks in Louisiana added her to the litter as a way of saving one more life, and Husky House just couldn’t say no. When I met Lilah and Jasper, and watched them run up and around and over and through the furniture and stairs on the deck, I couldn’t break them up. They needed to come to me as a pair, as a unit. Which is how I wound up with both of them. Lilah with her best friend and brother Jasper. 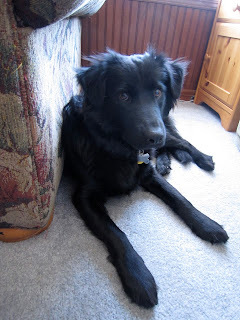 In her foster home, Lilah seemed confident and playful, friendly and affectionate. However, once she was in our home, I realized that I had seen a dog on her familiar turf, and now that she was in a new place, her insecurities came rising to the surface. Lilah had been with us only a week or two when we had some contractors working on our gutters. I was about to take the dogs out through the garage, when I realized one of the men was working on a ladder in front of the garage door. I went outside and asked the workers if they could stop for just a few minutes while I took my dogs out. Though they nodded and agreed, in retrospect I think they didn’t really understand me, because just as we got through the door, one of the men started using his automatic hammer, which startled Lilah so much that she pulled incredibly hard, slipped her collar, and took off, crashing into and tripping over old gutters that were lying on the driveway. They clattered and banged, sending her into a panicked run. I dragged Jasper back into the house, yelled at the men to Stop Everything while I tried to calm Lilah and lure her toward me. Luckily, she didn’t run too far, but by then she was so terrified that she wouldn’t come near me or the men or the house, let alone the garage door to come inside. At that point, I was near panic myself. Finally, I ran through the garage into the house and out the front door, while Lilah was pacing in the front yard. I opened the front door, and held Jasper next to me, calling to Lilah, hoping that the sight of her brother and the open door away from the men and the noise would give her the passage to safety inside the house that she was seeking. The poor thing ran back and forth in front of the door, and then sped into the house, ran straight into the family room, where she hid in a corner, cowering and shaking. I held her and comforted her, and cried with relief. Lilah is Very Concerned because there are noisy people playing with a soccer ball. After that, it took a month to get Lilah to walk through the garage without abject terror in her eyes. I would walk slowly, holding treats (which she ignored) and talking gaily and in a high pitched happy voice as if the garage were a magical place of squirrels and rainbows and treats and dog bones. Lilah’s skittishness was large; sudden noises startled her, new people intimidated her, strange items in her environment scared her. Everybody who walked into the house had to leave purses and bags and packages on the front porch because they frightened Lilah. In the back yard, Lilah would run to the door in an attempt to escape into the house when the neighbor used his lawn mower or leaf blower. She sat all the way across the yard when I unrolled the hose to water plants, and the wheel barrow was a monster. And when packages were delivered, Lilah would run and hide when the UPS man tried to give Jasper and Lilah dog biscuits. I had to save Lilah’s and give it to her after he left. Her border collie inheritance made Lilah hyper aware of her surroundings, and the slightest change would make her nervous. Once, we sold a piece of furniture, and put Lilah and Jasper in another room while the buyers came to take it away. When Lilah came back into the room, she stopped short, stared at where the piece had been, and, flattening herself, she sniffed suspiciously at the empty spot where the absence of a thing was unnerving and worth investigating. For several hours, she wouldn’t walk in the area on the carpet where the furniture had sat, as Jasper bounded through it without even noticing anything had changed. Taking Lilah and Jasper to a pet store was an uncomfortable experience. The swoosh of the automatic door opening as we walked in startled her. Shopping carts terrified her. The sound of a palette loader beeping as it backed up scared her. And once, someone dropped a bag of dog food behind her and she just about jumped out of her skin. 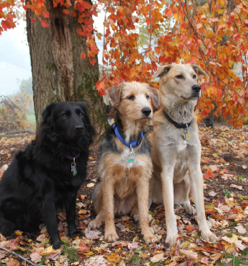 I took Lilah and Jasper to basic obedience classes in one of the large, chain pet stores. And while Jasper thought it was the Best Thing Ever, because there were People (his Best Friends, Always) and Treats, Lilah spent much of her time worried about The Next Scary Thing that was sure to pop up any minute. It was actually quite sad, and I thought it was a horrible way to live, to be so unsure of so much around her. Lilah always felt a little better when Jasper was nearby. While we did manage to get through the classes, I knew Lilah needed more help. Jasper also needed a bit more training, as his puppy exuberance was still a turned up a little too high, so I signed them both up for an obedience class with Anne Macaulay of On Good Behavior. I knew Anne because Rosie and I had taken agility classes with her, and I loved the way Anne worked with dogs. Agility is an activity where dogs run a kind of obstacle course, through tunnels, over jumps, weaving in and out of poles, walking a doggy equivalent of a balance beam. Rosie had been a natural; she was fearless and competitive, and loved going to classes. If not for her untimely death, we may have chosen to pursue the activity with her, as her focus, natural ability and joy made the classes sheer pleasure for me. That’s when it became clear to me that scared, nervous dogs are potentially aggressive dogs. And I was not going to let that happen to Lilah. So, with suggestions from Anne, I worked with Lilah. One of the most basic things we did was a little game I called Touch it With Your Nose. To start, I just had Lilah touch my closed fist with her nose. Touch my fist, get a treat. Touch my fist, get a treat. Once she understood that, and trusted the concept, I then had her touch my fist near a Scary Thing. A box. A trash can. A purse. Eventually we worked up to having Lilah touch the Scary Thing itself with her nose. A bag of groceries. A TV remote. A hair brush. A magazine. A flower arrangement. Jasper learned the trick, too, and sometimes he would so enthusiastically touch something with his nose, that he would move it. Which made it scarier, and then Lilah would have to work up the courage to touch it again. Lilah touches a flower arrangement with her nose. Jasper helps. Lilah approached every scary object, even one that looks like a dog, with trepidation. But once she Touched it With Her Nose and realizes it's harmless, she can move on. The classes with Anne helped tremendously, because she was able to adapt some of the exercises to each of the dogs. So while Jasper’s goal was to greet people without jumping, Lilah’s goal was simply to be able to greet people, and not hide. I would meet visitors at my door, holding dog treats in my hand, and explain in detail how to give Jasper a treat if he sat, but Lilah should be tossed a treat just for approaching. After the obedience classes were over, Anne suggested that I try agility classes with Lilah--and even Jasper. “Agility? Really?” I asked. Anne told me that she had had great success with nervous dogs in agility training, as their confidence increased through some of the activities. I decided to try it. I have to admit I was nervous, and the first few classes were a challenge. Jasper, who at first glance seems like a big klutz, took to agility really well. I think it was the first time both his brain and body were challenged and he liked it. Lilah, on the other hand, looked at the whole field full of Scary Things and was somewhat intimidated. In one of the first few classes, we took it as a huge success to just get her to sit near the tunnel as other dogs went through it. A class or two later, Lilah Touched the Tunnel With her Nose. The next class, she walked through a shortened version. The following week, she ran through the entire thing. Lilah on her perch; for agility class, we would teach her to jump up on things. Now, she loves to survey the family room or look out the window at the birdies. We would practice at home getting Lilah to put her paw on something new. I’d put a Kohl’s circular on the floor and reward her for putting a paw near it. Then she’d be given a treat for actually touching it with her foot. Then one paw on it. Then two. Then standing on it. I also had agility jumps at home that I bought when Rosie was learning, and Lilah was rewarded for getting near them. Then walking between them. Then stepping over the pole. And finally leaping over. It was amazing to watch. As she gained confidence with the equipment in the agility field, Lilah gained confidence elsewhere. She still had to Touch it With Her Nose a lot, but she was becoming less and less skittish. Lilah could leap over the jumps with ease, and she walked on the “balance beam” without any issues. Agility classes ended for the fall, and I continued to work with Lilah. She began approaching Scary Things on her own and Touching them With Her Nose. They were slowly becoming just New Things, and not scary. Greeting people at the door became a joyful event, with Lilah wagging and smiling and happily accepting pets and hellos. Visitors walk in the door with suitcases, and it’s no big deal. A confident Lilah in the snow, taking a break from running and playing and general winter doggy mayhem. Today, unless you knew Lilah a year ago, you’d never know the extent of the fear she conquered. She’s not quite as exuberant as Jasper, or Tucker the puppy. 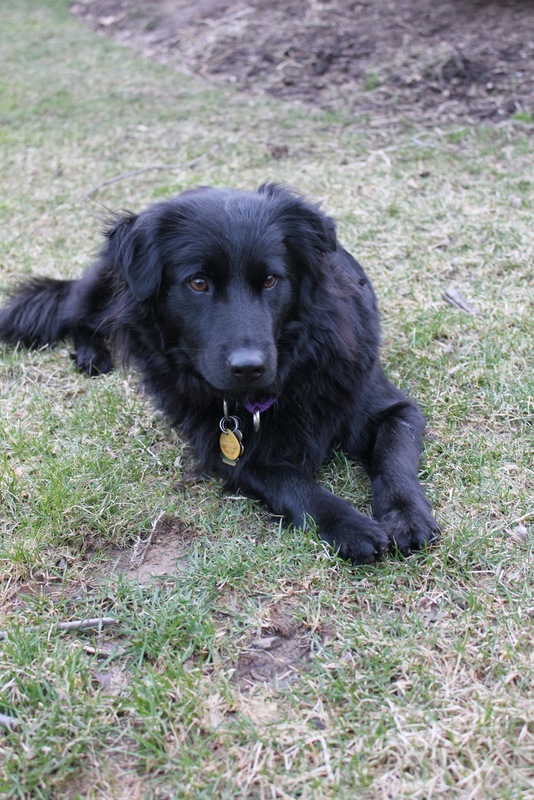 Instead Lilah has a light touch, gentleness and a sweetness that attracts people. I can drop a pan in the kitchen, with a great clanging and banging, and Lilah barely lifts her head. Our electrician can walk through the house carrying boxes and equipment, and she’ll wag at him. And Lilah reads humans like books. A great judge of character, Lilah seeks out people who are calm and centered, and lays at their feet. Sweet, brave Lilah. You can see the calm confidence in her eyes. She's come a long way. Now with two noisy, bouncy, rough-and-tumble brothers, Lilah is confident enough to chase them, argue over sticks and discuss ownership of a bone. And she’s quite happy to accept a dog biscuit from the UPS man. Great story. Love reading about dogs overcoming their fears and the techniques they use...all things I can use with Maggie. I appreciate your reference of " the next scary thing". We have the same concept with Maggie. What's so wonderful is the changes on them as they slowly build confidence and they turn into dogs! This made me teary. In a nice way. This made me teary in a nice way.